- I don't buy clothes. I bought an $89 pair of pants last month, which replaced the single pair of pants I've owned since 2009. I have two t-shirts and two pairs of underwear. That's my wardrobe. Years ago I went clothes shopping almost weekly, rarely leaving without at least one hundred dollars worth of clothes (usually Cavalli jeans or shirts). Even if you're not a total idiot like I was, your bottomwear budget is probably higher than $44.50 per year. - I don't buy alcohol. I'm told that most people spend hundreds of dollars per month on alcohol. I find that nearly impossible to comprehend, but so many people have corroborated it, that I'm resigned to take it as fact. - I have no debt. Servicing debt makes no sense at all. If you can't afford to buy the car you want in cash, then you shouldn't buy it. It's a depreciating asset. I'd rough it on the bus for a couple months while saving money and then buy a motorcycle or crappy $1000 car. - I have no TV. The purchase price of the TV is mostly irrelevant, but I understand that monthly cable/satellite costs can be upwards of one hundred dollars. - Oh yeah, I don't pay (much) rent. I actually do pay for a parking spot for the RV now, but that costs me only $275 per month. These apparent occurrences of thrift clash with other ways I spend money. I pay $110 a month to be a member of a spa in San Francisco, because RV showering leaves a lot to be desired. I travel nearly constantly (10 countries in the past month, for example). I'm seriously contemplating the purchase of $1000 headphones. I have a nice motorcycle. In other words, I polarize my purchases. This is because I choose what to buy with value and utility in mind. Most people buy things-- subconsciously, at least-- in order to create a coherent image of status. Think about it-- a middle class family generally has middle class everything. Middle class cars like Hondas or Fords. Middle class clothes like Gap and Abercrombie. Middle class houses. Middle class restaurants. How can this possibly make sense? Is there some mysterious phenomenon that causes people to exclusively lap up middle class goodness as soon as they get their first taste of it? Of course not-- devoid of any serious thought on the subject, people slide into convenient socioeconomic molds. If Middle Class Marvin wants a Ferrari, he won't figure out how to buy a Ferrari. He'll think he has to raise his ENTIRE living situation up to the level that would normally count a Ferrari amongst its trappings. That's a seriously heavy ball and chain to drag around. Instead, it's better to ruthlessly cut away expenses that aren't important to you, and allow yourself to spend money on things that do matter to you. That means that, if necessary, you give up on the "nice-to-haves" in favor of the "desperately-wants". My "desperately-wants" are mainly travel and technology. I consume in those categories far above average for my relatively-low income bracket. When faced with this, people assume that I must be rich. But they don't realize that I have one pair of pants and have never bought an alcoholic beverage. If you were to nix, as I have, all of the items that I listed above, you'd have an additional $1275 per month to spend on things that you actually care about (clothes: $50, alcohol: $300, debt interest: $100, TV: $100, rent: $725). How you acquire these "desperately-wants" is important, too. Fellow passengers on a recent two-week cruise couldn't fathom how five youngsters could afford to pay, and I quote, "three thousand dollars for a cruise, plus drinks". We didn't; each of us paid less than seven hundred dollars and only one of us bought drinks. We shop efficiently, trying to make our "desperately-wants" purchases the lowest possible price for the best possible item. 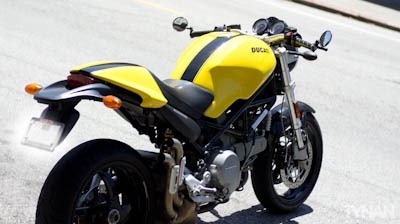 When I shopped for my first motorcycle, I ended up buying a 2003 Ducati Monster 620. Since Ducati is sometimes considered the Ferrari of the motorcycle world, people wondered out loud how I could afford such an expensive motorcycle. What they didn't realize, until I told them, is that I waited a month looking for the best deal on it, and paid only $2500. Most entry level bikes that couldn't keep up with the Ducati, and wouldn't turn a single head, cost more than that new OR used. If Todd hadn't reduced my sweet motorcycle into a metal abstract-art sculpture, I could have sold it for at least a thousand more than I paid for it. That's the benefit of buying premium items at discount prices-- they actually end up being better than free because you pay under-market value and they end up holding their market value well, due to their quality. Six months ago I bought an $875 lens for my camera; yesterday I sold it for $885. So, to get back to the initial question: how do I do a manage my finances to do whatever I want? I do it by making sure that my finances are only obligated to things that I REALLY want, and I give those purchases the consideration and patience they deserve. Welcome to I Will Teach You To Be Rich readers! Check out Ramit's favorite post about getting tutors, and a video of me absolutely crushing him in Liar's Poker. Special free thing for IWTYTBR readers: Get an invite to my beta social productivity web app, TaskSmash. Just email me a link to a comment you've left on Ramit's site (to iwtytbr ([email protected]) tynan.net ) and I'll reply with an invite good for you and a friend. As Will Smith once said, "People buy things they don't want, with money they don't have, to impress people they don't like." Lol, my comment is from two years ago, I'm over it. I really like this philosophy, and what a great bike!!! People generally don't understand what their money actually does to their state of mind, and perspective of reality. live the life of truth. and complete non inhibition. gave away posessions now have a fishing boat and a full life, like waking up for the first time. looking forward to experiancing the best part of this lifetime. - alot of people leave there ac or heater on for too long, ac and heater consume a shitload of electricity. - automobiles and gasoline i must say are HUGE. buy a used car from 4 years ago, and you can eaisly get similar quality for more than half off, its crazy, as for gasoline, driving at 40 miles per hour on the highway DOUBLES your mpg on most cars. by far the biggest is debt. seriously DONT buy things you can afford, its stupid. like honestly its not worth it EVER and i mean EVER. for example for college to get a loan for 25k and pay 250 dollars a month i would have had to pay over 40k!!!!! !in interests WTF??? seriously that is stupid. debt is by far the biggest killer. also tynan yes, ive done the math, if u take 14 day cruises for 500-1000 dollars a trip it is by the most affordable luxury lifestyle, its pretty amazing. I love cruises for this reason. As for alcohol most cruises offer a 20-40 dollar a day coupon for infinite drinks under a certain value. Which is amazing if you DO drink. also on cruises most of the excursions are overpriced. my tips to saving money. Bike, no seriously, bike. In most cities there is soooo much traffic during comute times that biking is equaly fast, sometimes faster. Also biking( i mean with pedals) is good for your health and as u get better you'll only get to where you want to go faster. "what about when i want to go somewhere far" rent a car, renting a car is very cheap imo, espcially if ur not travelling inter state very often, also if u use american express u get full insurance( at least at hertz i believe) which saves u even MORE money. furthermore, usually you don't go far alone, so you can split the cost with friends/family, or use a friends/family' members car. don't leave in downtown or somewhere expensive. Its stupid, just living 5-10 blocks away from city center you can save upwards of 20%, its pretty crazy. last but not least the biggest one is tynan final point. Just cause one aspect of your life is "upper class" the rest doesnt have to be. If you like eating in gourmet resturants (like i do) you don't have to live in a big house, have a nice car, or dress with nice clothes. I enjoyed your post, I too am frugal with owning "stuff". I've been reading through loads of your material over the past day and I'm sold on trying the RV lifestyle. But in everything I've read you haven't mentioned laundry! Do you use a combo of coin laundry and family/friends? With only four shirts I imagine you're doing laundry at least once per week. Thanks! Nice one! I especially like the start, here is a better question.. In light of both this and the horrific shootings at Sandy Hook Elementary School in Connecticut last month, I thought it would be a good opportunity to share my thoughts on the ongoing debate surrounding gun control. I have to first say that in spite of my own experience with the barrel of a gun I am not opposed to the right of people to bare arms. In matters of self-defense against thieves, terrorists, rapists, and all sorts of perpetrators, I think that the mindful possession and minimal use of a gun is reasonable.